Educating young children about the holocaust is a difficult task. 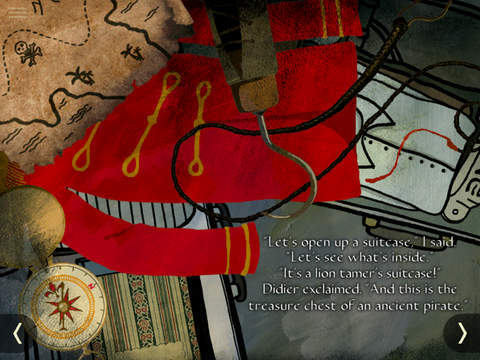 This app tells a story that provides a superb introduction to the subject and can form the basis for parents and teachers to introduce the facts about the time and events. Most primary aged children will learn something about the Second World War. This app is a superb way of addressing one of the most difficult topics within the subject, the holocaust. It isn’t a fact book nor a true story, but it weaves the tale of two children who are forced along with their father to go to Auschwitz. The decision to tell a fictitious story rather than a factual recount is a good one. The story can make its point and can educate without becoming lost in the morality and factuality of representing real people who lived through it. It is a well-researched fiction that can offer teachers and parents some perfect discussion points. Uniforms, certain comments and the presence of yellow stars are a few such details. This leaves it to adults to decide which aspects of the story they think are appropriate for their children. Most schools will have some history books that children can refer to and look deeper into the history. This app excels at providing the inspiration to dive further into them. It is impossible to imagine a better style of artwork to match the story that is told. A darkness lives within each scene, enhancing the pathos of the whole narrative. At times stylised and abstract, at others grimly stark and real; it is always perfectly suited and interesting. Embellishments attract the reader’s interest. The falling of snow, the lapping of waves and the illumination of lights augment the artwork without overpowering it. 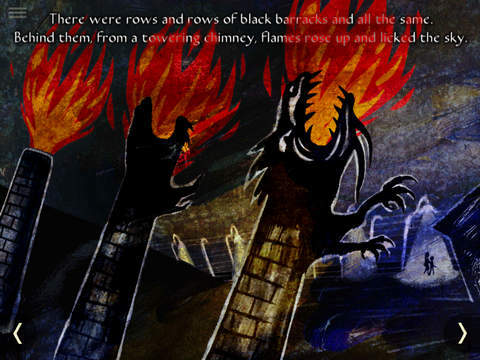 Children can read the story to themselves or choose to follow it as a narrator clearly reads it. The speaker uses American pronunciations with certain words but these are rare. Short passages of music enhance certain sections, either adding to the tragic nature of the story or uplifting the few pleasant remembrances of the characters. There is little hope displayed in the story and we never find out what happens in the future. It poignantly ends remembering happier times and children can hope that the characters in the story do eventually make it through. Teachers can decide how much to prompt their imagination to follow a less optimistic path. The app contains some extra materials to provide a degree of factual background. A timeline covers the key years of 1933 through to 1945. This is useful to ensure that children have a way to answer any questions that they have. Unfortunately, it isn’t as well-polished as the rest of the app. The structure and layout of the text could do with some work. Another section provides a map of the concentration and extermination camps that dotted Europe in these years. The sadness for those within the story and for us who know that it echoes history never lets up. The story needs to be told and it needs to be heard by each child. There can be no expectation for this app to offer anything other than to inform and educate, it is not the place for entertainment. What it is, is a superbly made app that covers its difficult subject with sensitivity and integrity. It certainly deserves to be seen by every child. 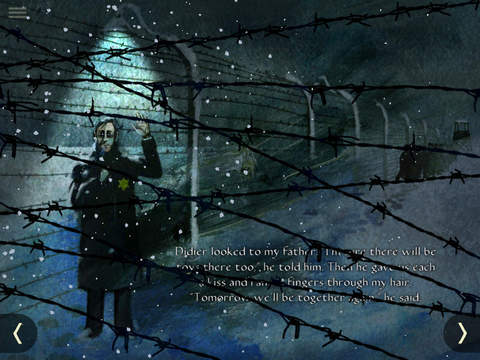 An interactive app to familiarize children with the story of the Holocaust. 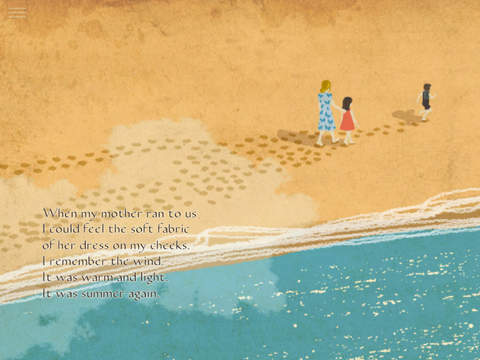 The delicate, touching narrative is paired with illustrations, animations, and music. Extra features include maps and a historical timeline. Where to begin, with a story that «we are not prepared to understand» (Hannah Arendt) and that seems so distant from the present? This App helps children to approach and understand the Shoah through words, illustrations, music and interactive features. Simply, delicately, the tale encourages young readers to develop questions and seek answers about the tragedy of the extermination camps. The App tells the story of a father and his two children, Didier and Jou Jou, and their deportation to Auschwitz. The tragedy, however, is only suggested, looming in the background of a captivating, graceful, and poetic first-person narrative. Through the eyes of the two young protagonists—which act as the gaze of the reader—places and events in the concentration camp take on a magical, fairy-tale like quality: the chimney becomes a dragon, the barracks an aviary, the depository for the deported Jews’ belongings «the room for travellers». And set against their experience of the camp are memories of life from «before», now lost forever—their tender and reassuring days of life as a family. 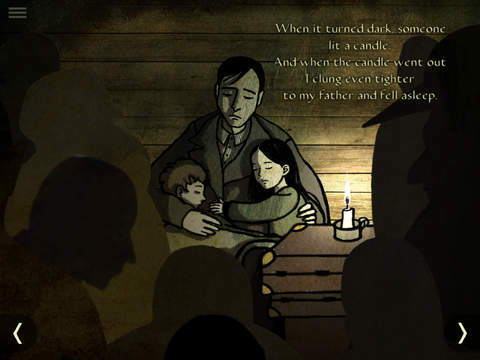 The App includes a timeline of the Nazi persecution of Jews and of the Holocaust, as well as two maps of the main extermination camps and of the Jewish ghettos—all of which serve to help parents and teachers explain the fictional tale and move beyond the text to deepen childrens’ understanding of the surrounding history.